BMW R850R - The Perfect All-Rounder? The marketing of motorcycles is irritatingly compartmentalized. There are scorchingly fast sports bikes, kitchen-sink tourers, off-road dirt bikes, scooters, commuters and choppers. Each is designed and targeted at a very narrow band of potential customers. Every so often a manufacturer will claim to have invented the perfect all-round motorcycle, but precious few really stand up to scrutiny. A true all-rounder would need to be decently fast, handle and stop well, be comfortable for hours on end, be well made and reliable, and yet be easy to manoeuvre and park. A tall order. What we have here then is the BMW R850R, the entry level model to BMW's German made bikes, an important distinction as they also make a smaller series in Italy. At just under £7,500 on the road it is hardly cheap, but it is by BMW standards, and you get a lot of expensively developed technology for your money. What you get is the latest oil/air cooled twin cylinder engine, Telelever front end (effectively forkless forks), parallelogram rear suspension, fuel injection, height-adjustable seat and a minimalist chill-cast frame, all a bit too detailed to explain here but you can rest assured that it all works just as it should. Regrettably what you don't get is BMW's excellent ABS2 anti-lock brakes, deleted to keep the cost down, although it can be ordered as an extra, as can a catalytic converter. The bike is well finished in the German tradition, if perhaps not to just quite the same standard as the heavy-metal Bimmers of old. The looks are definitely of the love 'em or hate 'em variety, but you at least have to admit that in a world of look-alike Japanese bikes, it is strikingly different. 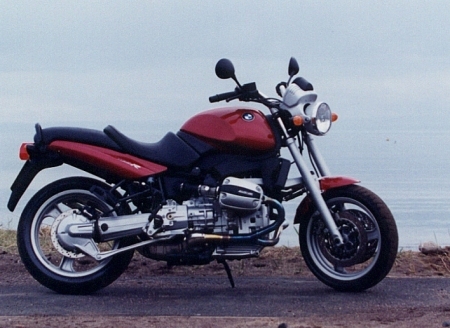 It is a very easy bike to ride, and that is not something you could always say of BMWs past. The riding position is near perfect, and very comfortable. Controls and switchgear are typically BMW, but none the worse for that. The engine is both sweet and characterful at the same time, a tough act to achieve. It bimbles around town with hardly a murmur, but open the taps and it can propel you from 0-60 mph in just over 4 seconds, with complete composure. The dashboard has a real touch of the Dan Dares about it, who says the Germans don't have a sense of humour? But the handling is the cherry on the cake, as it is simply superb. The combination of the new technology suspension, low centre of gravity, and super-sticky Bridgestone radial tyres give this bike the road-holding and braking prowess of an out and out sportster, yet it as amiable in a car park as a bike half it's size. My weekend with the bike took in sunshine, rain, fog and gale force winds. The bike coped admirably. I pottered through town, zipped round bends, slogged up motorways, in short went shopping, scratching and touring. The bike did it all superbly, but with one weakness. Like all unfaired bikes, going any distance on a motorway or decent A-class road becomes a pain. Literally, your wrists, arms, neck and back all strain against the constant wind blast coming straight at you. BMW market the bike as a Roadster, and all of their advertising copy stresses sunny days and wind in the hair type fun. Perhaps unsurprisingly this hardly cuts much ice in Scotland, and the bike is a perilously rare sight on the roads north of Hadrian's wall. When did you last see one? BMW seem to have now switched their formidable marketing expertise to the bike's larger and costlier fairer brothers, which are probably better suited to the weather here. But I reckon BMW are missing a trick here, and that is most unlike them. With just a few well chosen accessories from their own catalogue, you could relatively easily turn this little bike into that most elusive of devices, the perfect all-rounder. Just add a neat plexi-glass windscreen to keep the wind blast off your chest on the motorway, and a set of pannier cases for a weekend trip, and hey presto, you have a remarkable capable all-purpose machine. Better yet, if you buy this bike as a relative novice, it's user-friendly nature will win you over, but as your skill and experience grows you will find astonishing levels of real-road performance waiting for you in that innovative chassis. Quite an achievement. So if you are in the market for a bike that can do everything well, and which you can mature into as well, you could do a lot worse than check out the R850R. Nice one Herr Bimmer.